Over the last few years, mutual funds have become a preferred way of investing for many investors. The primary reason, of course, is the booming stock market. Apart from this, however, there are many other reasons such as professional management, diversification, convenience, tax-efficiency, wide variety of schemes suiting to different needs, etc. However, some confusions and misconceptions still persist in the mind of many investors. One, of course, is the misconception that low NAV fund is cheaper and therefore better than a high NAV fund. Second is dividend, which an investor assumes to be some extra benefit; whereas it is already part of the corpus and hence reflected in the NAV. Another common problem with most investors is whether to opt for Growth Option or Dividend Option; and if Dividend then whether Payout or Reinvestment. Let us look at the detailed example below. After another 1 year, both funds have appreciated by another 20%. As can be seen from the above example, it makes no difference to the final returns whether one invests in a Growth Option or a Dividend Reinvestment Option. The returns are lower in Dividend Payout, because the dividend amount does not get reinvested. Now let's look at Fund B. Both Growth & Dividend Reinvestment Options are same. It makes no difference to your returns. Dividend is not something extra. 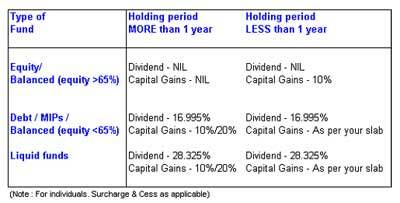 Your returns from a Dividend Option and Growth option are same. 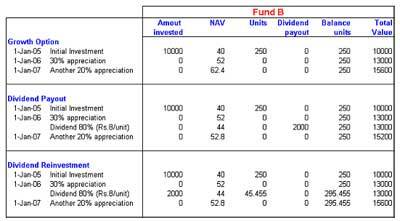 NAV of fund is also irrelevant. Your returns are same whether you invest in a low NAV fund or a high NAV fund. The only point where the selection of option could make a difference is TAX. This is because the tax treatment is different for (a) Dividend and Capital Gains, (b) Long Term and Short Term holding period and (c) Equity Fund and Debt Fund. For equities, since it is recommended to have a longer investment horizon, the choice of option is not relevant. Therefore, you need to only check the option carefully, when you are investing in debt funds. This comprehensive example should clear many doubts that a common investor has when investing in MFs. The focus should be only on selecting a fund with good growth potential; rest all viz. NAV, dividend history, options are unnecessary and irrelevant details. The author is an investment advisor and can be reached at sanjay.matai@moneycontrol.com. For more on mutual fund investments, log on to www.easymf.com.